After all, should you take the credit rating agencies seriously? The answer is no. Brazil is a net external creditor, that is, though the federal government has debt denominated in foreign currency, it holds more foreign currency assets (figure 1) than it owes in foreign currency debt (figure 2). Brazil’s public sector can pay all of its long-term financial obligations denominated in foreign currency. Moreover, Brazil’s federal government can never become insolvent on obligations denominated in its own currency (note that since 1999 Brazil maintains a floating exchange rate regime, which increases domestic policy space). A closer look at indicators of external vulnerability (figure 3 and 4) show that there is no solvency risk associated with Brazil’s external public debt. As of March 2015, Brazil’s foreign currency-denominated government debt amounts to US$ 72 billion and Brazil’s international reserves position (US$ 363 billion), which is sufficient to pay its short- and long-term obligations denominated in foreign currency. Following Brazil’s upgrade to investment grade status by Standard & Poor’s and Fitch in 2008, low interest rates in global financial centers since the aftermath of the 2007-2008 global financial crisis have pulled Brazilian non financial companies to tap international markets (figure 5 and 6). 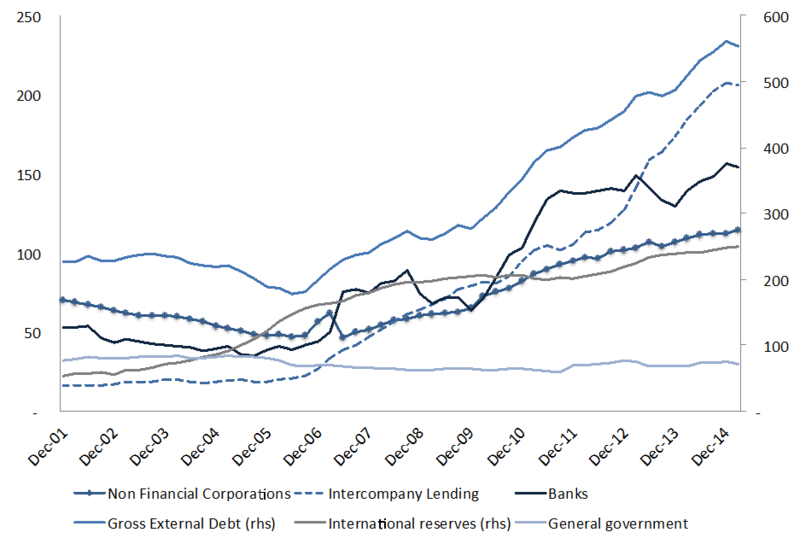 During this period, Brazilian corporate issuers have sharply increased their external borrowing through foreign subsidiaries (see for instance Bastos et al. 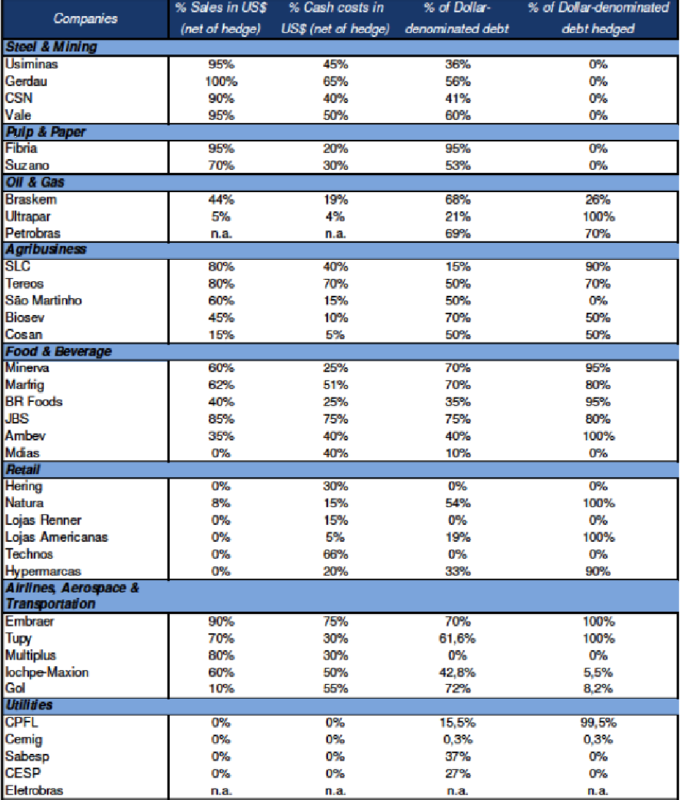 2015; Avdjiev et al., 2014), in which investment-grade corporate bonds witnessed strong issuance. Moreover, low or negative bond risk premium in advanced economies have pushed investors’ demand for higher-yielding assets (Shin 2013; Turner 2014). Brazil’s corporate sector has experienced a sharp increase in foreign-currency debt since 2007. 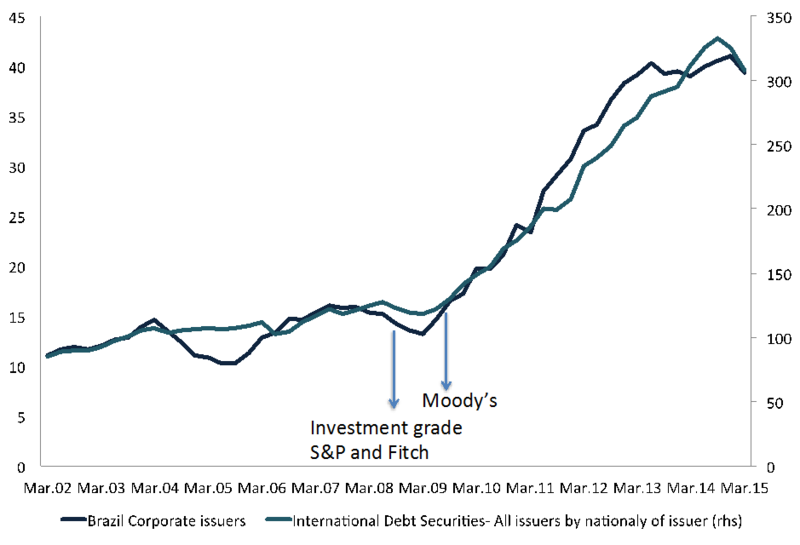 That is, Brazilian corporate issuers of U.S. dollar denominated debt are subject to foreign exchange risk, deterioration in international funding conditions such as rising interest rates in advanced economies, a reversal of investor’s risk appetite for emerging market debt, which can cause refinancing problems as international borrowing costs rise and global liquidity dries up. So, with the increase in external issuance foreign currency bonds by corporates and banks there has been an increase in foreign currency exposures risks, in particular for unhedged foreign currency debt (table 1). However, these risks can be managed effectively. The adoption of a floating exchange rate regime in 1999 eliminated the problems Brazil used to have when it adopted a fixed exchange rate regime. 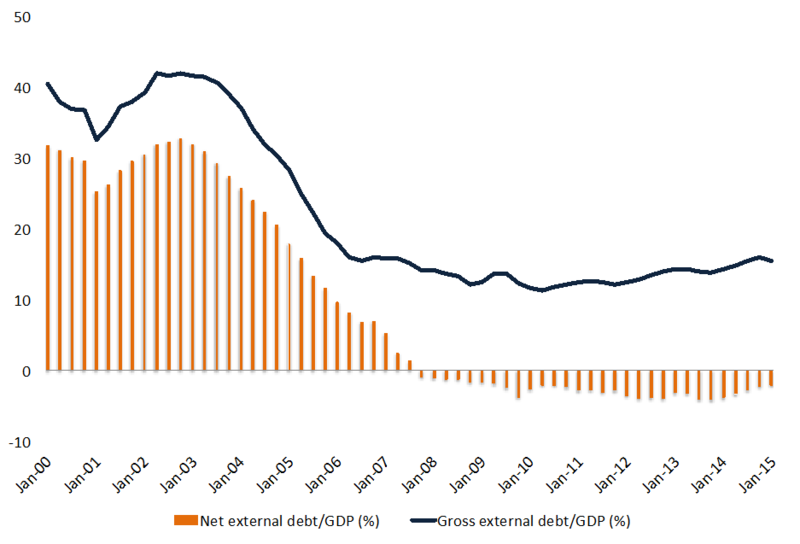 It has become a net external creditor and it has improved external debt ratios, and thus eliminated an historical source of external financial fragility. Moreover, the Brazilian Central Bank (BCB) is ready to implement programs that will use its US$363 billion of foreign reserves to smooth exchange rate volatility and support foreign currency liquidity. 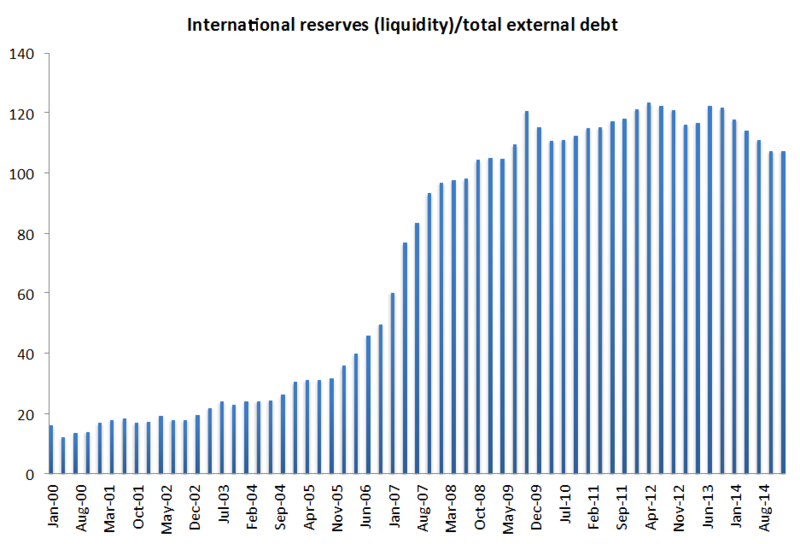 Here is what the government should do: it should use its foreign currency reserves, which are mainly invested in liquid sovereign bonds (figure 7), to pay all of its foreign debts. 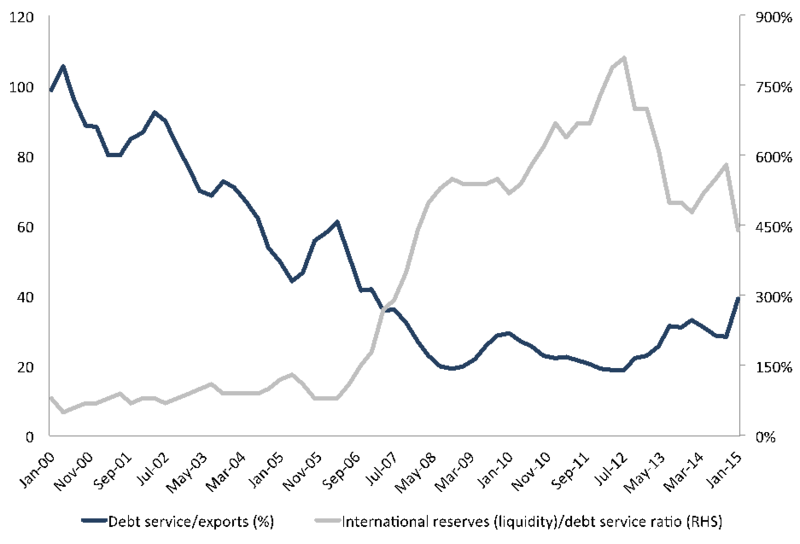 Brazil will still hold a significant amount of reserves (US$ 295 billion) and without sovereign debt obligations in foreign currency the ratings are irrelevant. S&P also downgraded Brazil’s long-term local currency sovereign credit rating to ‘BBB-‘ from ‘BBB+’ and the outlook is negative. So what did they announce about it? Brazil’s 2016 budget proposal tabled on Aug. 31 incorporated yet another revision to the government’s fiscal targets in a short period of time. The proposed budget is based on a primary deficit of 0.3% of GDP, rather than the previously revised 0.7% of GDP surplus target that was announced in July. This change reflects internal disagreement about the composition and magnitude of measures needed to redress the slippage in public finances. Really? S&P is complaining about lack of budget cuts? That is, is it complaining that the Rousseff’s administration is reluctant to implement “reforms” that will slash the social safety net? Is it trying to influence the political process behind budget outcomes in a society that operates with a democratic political system? Brazil is a sovereign government with a sovereign currency. Note that Brazil’s net general government debt is close to historical lows (figure 7). So, should Brazil be downgraded to junk? Are there solvency risks associated with local currency debt? The answer is no. Unfortunately, analysts, mainstream economists, and market pundits fail to distinguish between a currency issuer (e.g. Brazil) and a currency user (e.g. Greece). Brazil is a sovereign government that issues its own currency (Real). It is the monopoly issuer of a nonconvertible floating exchange rate currency so solvency it is not an issue. There is no solvency risk in obligations denominated in the domestic currency. It spends by crediting bank accounts with the central bank and collects taxes by debiting bank accounts with the Brazilian central bank (BCB). The Treasury account with the BCB is an accounting record of credits and debits to the Treasury (Rezende 2009). Permeated by the false idea that Brazil faces a fiscal crisis, it was also caught up in the austerity fever, which contributed to its worst economic downturn in 25 years. Moreover, as I have argued elsewhere, because Brazil has an external sector deficit equal to 4.34% of GDP as of July 2015, then government sector has to run a deficit greater than the current account deficit to allow the nongovernment sector to accumulate net financial assets. An attempt to run fiscal austerity in this scenario brings about further declines in income and employment, which can result in a Minsky-Fisher type debt-deflation process. We also need to look at the macro provision of liquidity and incomes. Private financial liabilities (IOUs) denominated in the state unit of account represent short positions, that is, forward commitments to deliver currency. Ultimately, only the government (the treasury and central bank) is a net supplier of currency. To convert private financial liabilities (IOUs) into the government’s currency, ultimately requires the existence of government deficits and central bank lending facilities. However, as long as policymakers believe that the federal government faces a budget constraint due to the inappropriate application of the household budget constraint to a sovereign government, there will be resistance to adopt an alternative policy. For instance, the Brazilian Treasury secretary and market analysts have expressed their concerns about the domestic public debt. The government is being pressured by markets to run targeted primary surpluses to convince lenders of the ability to meet the debt service (note that this policy has similarities with the structural adjustment polices implemented in Latin America, which also caused crisis). Brazil’s current crisis is not due to a government debt crisis, though the conventional wisdom believes that Brazil’s sovereign debt is “unsustainable.” The attempt to run primary surpluses is driven by the belief that you need to stabilize the government debt to GDP ratio and convince lenders of the ability to meet the debt service (does that sound familiar?). 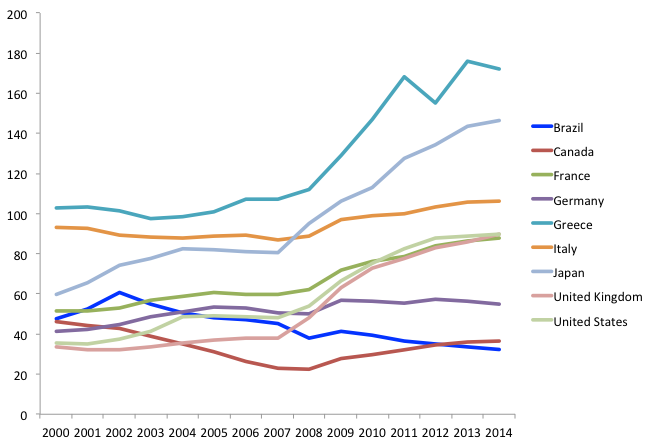 Again, as expected, fiscal austerity failed in Brazil as well. The conventional wisdom misses the important point that Brazil cannot be forced by markets to default on its domestic debt. It has attained monetary sovereignty, that is, it issues its own currency and it has adopted since 1999 a floating exchange rate regime. From this perspective, there is no need for a risk premium. Unfortunately, the federal government has announced a series of cuts in key areas including infrastructure, education, health, and important social programs when it should expand its investments in logistics, energy, innovation and so on. It will be necessary the adoption of an alternative policy to not only deal with the impacts of a dollar shortage but also to support domestic activity through a targeted government expenditure policy. It should also provide tax cuts to households and firms. Finally, it should adopt an employment guarantee program to everyone willing and able to work at the announced money wage. Regrettably, these policies are not on the government agenda. What I see in Brazil is that what worries people most of all is always inflation, which is for a long time above the Central Bank’s target and has had an impressive hike over the last year (to double-digits, which is enough to scare the hell out of people). For this reason, our policy-makers (and the analysts – and the population) would only be convinced of policy recommendations if they firmly believe that these recommended policies would bring the inflation rate down to the target level. With that in mind, it would sound in their ears very absurd a proposal of tax cuts to households and firms, which would arguably increase demand. Perhaps what I’d like to ask you is whether you have clues of what are the root causes of our stubbornly high inflation and how can we solve this issue. This is the most important point because it blocks everything else – I think Ms. Rousseff would be more than willing to massively increase public investments and deficits, if only we had inflation under control. You suggested in this article the employment guarantee program. In my view this is a very interesting idea, but very difficult to convince others of it. Since no other major country with inflation under control uses it, there should be other tools we could effectively put in place to control inflation without hurting the population too much. What I see in the economics debates today is that the only tool people regard as effective to control the inflation rate is maintaing sky-high interest-rates (SELIC), which I think it’s crazy. We are already paying roughly a quarter of the government’s revenues in interest payments and inflation only gets worse. Nice perscription–with the exception that it overlooks that printing money without increasing output would create inflation. 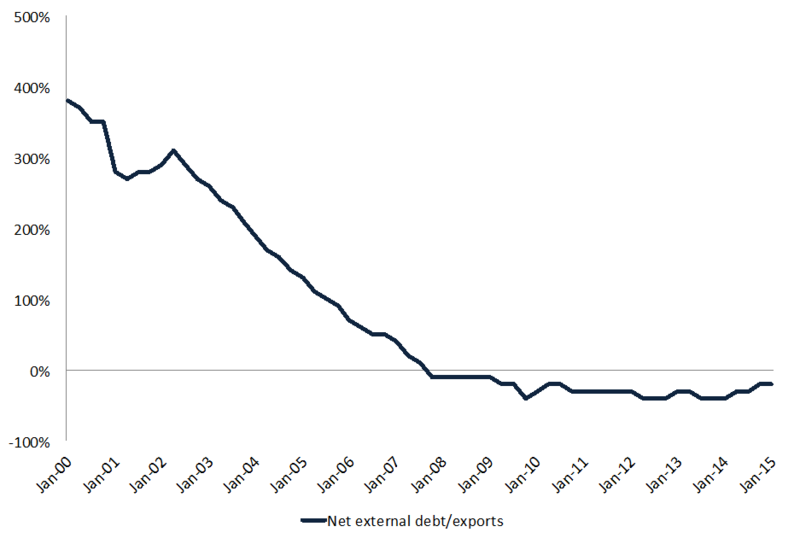 No doubt Brazil can easily service its external Dollar debt. But inflation creates unpredictable and difficult ot manage economic instability, and anyone who lived through the 80s and early 90s in Brazil knows this first hand. So the policy prescription of cutting taxes and increasing deficits would be disastrous. Please note that I am signing up to follow this post purely out of a morbid interest in accopanying the sloppy economic thoughts that may circulate among Brazil`s increasingly marginalized heterodox pundits. In no way to I endorse the less than thorough analysis or policy prescriptions.